When I ordered my Gram Weenie Pro stove I had the option of getting one of these mugs with it as a packaged deal, so I got the 10 cm mug. I had plans of using this as my dedicated mug whenever I carry my GSI Kettle with my Original White Box stove because of its light-weight and large capacity. The mug can also pull double-duty and can be used with the Gram Weenie Pro stove as a cook pot as well. The Imusa mug weighs in at 2.5 ounces and measures 10 cm ( 3 7/8 inch) in diameter and 3 3/8 inches tall. It is made of thin aluminum and has a slightly rolled lip which adds a great deal of strength to the cup. It has a piece of aluminum molded in the shape of a handle and is attached to the side of the cup. Like I said, the mug can be used as a cook pot with the Gram Weenie Pro stove, or simply as a light-weight mug. If the mug is used as a cook pot, a lid will need to be either acquired or made. A simple piece of aluminum foil should serve this purpose well, while maintaining a low weight. Last night I used the stove & mug set-up and it worked well. I did not use a cover over the mug, and used 1 ounce of HEET in the GWP stove which brought 2 cups of cold tap water to a boil in the mug in around 9 1/2 minutes. Upon initial impressions, I am happy with the mug. It seems sturdy, it is light-weight and has a rather large enough capacity to be used as a cook pot. The only downfall that I can foresee is that the mug will be hot when hot fluids are inside the mug, so I will be sure to check this out more and report back. Also, more can be read about the stove and mug combo here, as well as a video to watch. Update: I did mention above that the Imusa mug got hot when using to cook on, and that it took a while to cool down when using to cook in. I did not realize how easily it can become very hot though. This morning I decided to make a cup of coffee using the Imusa mug. I put the coffee in the cup, and brought some water to boil using my White Box Stove and GSI tea kettle. I poured the water in the mug, stirred the coffee up, and then reached for it. The mug (handle included) was HOT. So I let it sit for 2-3 minutes, still hot. I grabbed a paper towel to wrap around the handle and I was fine by doing this. However, once I attempted to sip from it, I realized quick like that the mug needed to cool way down before I could sip from it. I will say that the temperatures outside are in the 80′s so I imagine things would be different if the temperatures were around 30. It would probably cool down a little faster in those conditions. So, I will have to rethink using the mug for drinking hot beverages from, or find a way to overcome this. I guess I could simply let it sit for a little longer and let it cool that way. One other option that I came across the other night is the Snow Peak Hot Lips. I have no experience with them so I cannot say that they would work. First off, they are made for the Snow Peak products, so right off the bat, they may not fit. However, for $7 for two, and 0.3 oz each, they probably would not hurt to try. So, just wanted to share this little extra on the mugs. I will still happily take the mug out with me and use it in as many ways as I can come up with, but this was pretty obvious even for a home test, and figured I should go ahead and share. If for some reason this changes I will be sure to post back. Thanks again. Update: Today I received a private message from Karina from the Imusa company. She had read the review on the WhiteBlaze forum and has offered to send some products that could be of some help free of charge. This says a lot of the service at the company, in my opinion. This has turned out nice, a quality product, and a quality customer service. So, I will be sure to report back and write about how whatever is coming works out. I like the IMUSA products. Especially since they have that immigrant success story identity. Since aluminum and titanium conduct heat very quickly you’re going to want to get your cooked food or water into a cozy right away. The heat you are describing is coming from the food….aluminum is such an efficient conductor! If you dump that water out and within 15 seconds or so that aluminum cup is going to be the temperature of the air that surrounds it. You know, another reason your HotLips are going to help is that often when drinking out of metal we taste the metal. But that taste isn’t inside the food, so don’t let’s go worrying we have gotten metal into the food. We can always improve the flavor if we put our food/drink into something like a paper cup. So I use the aluminum and always carry some welder’s cloth & a 7 gram starbucks cup. All of those things are multi-use for me (especially the carbon felt, which I use for a windskirt and grabber and cozy). I find the aluminum weighs the same and is more sturdy and forgiving than some $50 titanium jobby. You risk denting your Ti by banging the Get Out Of Here drum when critters come into camp looking for a freebie. Nobody wants an expensive pot that can’t sit still on its own. And on the other side it’s never a risk melting or losing an ancient aluminum cup by sticking it into some coals when I come across someone who makes camp fires (like it’s still 1852). I will admit, it has been a long time since I have used any of my IMUSA mugs/pots. They are nice though, lightweight, easy to find, durable and the price is very attractive. 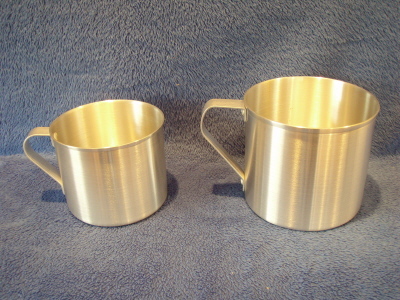 Saying all of that, I have happily been using my titanium pots (and cups) for a long while now and much prefer them over the aluminum. Partly because the shape of the pots I prefer to use I have in titanium, and they are generally as light as, if not lighter than, aluminum. Of course there is the concern about cooking in aluminum pots, which doesn’t really sway me one way or another, but when using a titanium pot, it doesn’t really matter anyway. However, the biggest reason I prefer to use titanium is because of it’s heat distribution, which I find to be a little different than what you describe. If I am boiling water in a titanium pot and the flame is not licking up the sides (it is all contained beneath the pot) I can actually grab the lip of the titanium pot with my bare fingers to remove it from the stove. What I have found is that above the water line, a titanium pot stays much cooler than at or below the water level. This is the direct opposite for an aluminum pot though… If I were to try and remove an aluminum pot from a flame with my bare fingers, I would (have) some burnt and sore fingers! Pardon me if you answered this already, but did the Snow Peak Hot Lips fit on the Imusa mug? Yes, the Hot Lips will work on the Imusa mugs. Yeah, I am pretty familiar with Tinny’s stuff…I have a few of his pieces. And obviously, I also have the 10cm IMUSA mug, but I got it a few years ago from End2End Trail Supply when I got my Gram Weenie stove… TBH though, I am not super fond of it. Nothing really wrong with it, but it just seems to take a little longer to boil water than in my other pots… but to be fair, I have not used it extensively. I did remove the handle from it though. So far, I have preferred them without handles. Stick! I’ve had my Imusa cup for a while now and have always had the same problems with it. I don’t know how much you’re into campfire cooking but I’ve found that this cup works a lot better over an open fire. Even when brewing a cup of coffee directly in it, I only have to wait a minute or two for the cup to cool enough to drink from it. I’m guessing, a canister stove is distributing such a high heat over the entire cup that it’s super heating the aluminum much more evenly than a camp fire does? Thought it was interesting and wanted to pass it along. Doesn’t really do much good if you’re in a no fire zone though. That is interesting. I will have to throw it in the fire next time I have one… Thanks for the info! Thanks, Stick. I cut the handle off of my mug. I found this to fit better in my pack. I also added pot wick (fiberglass string) around the mug so I can pick it up when it’s hot. I don’t know for sure, but the string may also contribute to insulating the water after it’s brought to a boil. A lot of guys use handkerchiefs but it’s nice having the sting on the can so I don’t have to worry about gripping the mug. I found the silicone band in a dollar bin at a local store, but haven’t tried it yet. I was just wondering what Imusa sent you and how it may differ from my set up. I just used an old hacksaw blade I had laying around. Didn’t take much effort. I think some tin snips would probably work, too. I was worried about messing with the rivets, so I only cut off the handle so the rivet and a small amount of the handle is still on the mug, but it sits very flush with the mug side. The fiberglass string is pretty nifty, I have to admit. I’ve been using a Zelph Superstove with my Imusa mug. The circumference of the mug is a bit small for that stove, in my opinion (works great with a slightly larger item like a grease pot). That’s what got me interested in the Gram Weenie Pro Stove. I’ll probably pick one up soon and give it a whirl. Forgot to mention, after I cut the handle off, you’ll want to smooth the area with sandpaper or a metal file. Hey, Stick! I use an 10 cm Imusa mug but haven’t used it to drink out of, just boil water and then add the water to a freezer bag to cook my food. I recently added a silicone band to the top hoping I can drink coffee directly from the mug without torching my lips–sort of like a “hot lips” item. What did Karina from Imusa send you? How did they work out? Were any of the items she sent similar to a “hot lips” or what I described? Any help is appreciated. As far as I know, IMUSA does not sell anything like the Hot Lips that are specifically theirs. I have been curious as to whether or not the Hot Lips would fit on the IMUSA cup or not though, never tried though. I would imagine that what you have done should work nearly as well though. My problem with the IMUSA cup/pot though is that the whole thing (meaning the handles too) heats up and it takes it quite a while to cool down. Really, it doesn’t cool down until the fluid inside cools down. That is one thing I like about my Ti Backcountry.com pot over the IMUSA cup. The Ti does heat up, but if I wait 30 seconds after taking it off the flames from a full rolling boil, I can usually hold onto the handle, and drink from it without burning my lips and fingers.